A few reminders and updates this afternoon!! 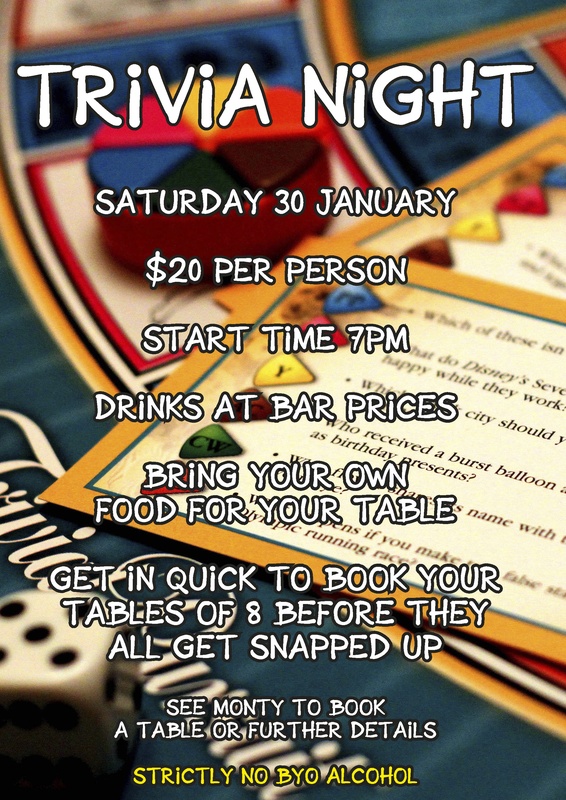 Please find attached the invite for the Trivia Night on Saturday 30 January. This will be a great night, so please come along!! If interested, make sure you get in early to book a table (let me know if you are interested in coming)!! Massive thanks to Buddy Mendis for running the cricket camps over the last week. Whilst the weather was variable, I understand those who attended enjoyed their time and the extra coaching they received. It is great that Buddy has been able to provide this extra coaching opportunity – thanks again Buddy for organising. · U16 start this Friday night 22 January. Therefore with the U16 match being the only game this week, please come along and support the boys, as they play Donvale. (The game is likely to be played at Donvale Oval no.1 on turf!! Check ‘MyCricket’ later in the week for confirmation, or feel free to ask me to confirm venue). Let’s try and get the boys as much support as we can. Match starts at 5.00pm. In conjunction with the Blackburn Cricket Club, we are running a Father/Son cricket day at Blackburn on Sunday Feb 14 for the Paul Callanan Cup. Paul is a Life Member at Blackburn and a club stalwart at Nunawading. The day is a family day where we will field two teams, one will be Under 16s/older boys, the other will be Under 14s/younger children. The games will start at 11 am, break for a BBQ lunch around 1.30 then resume and complete by 5 pm. This is a fun day, not a competitive one 🙂 If you have another combination (eg special friend, brother, mother etc) you are also welcome. Fathers/Sons will be encouraged to bat and/or bowl together.There is no cost and drinks will be available at Blackburn all afternoon. Can you please advise David Cowell at dgcowell if you would like to play. Finally, lets all cheer on the Renegades tonight, as they try and qualify for the BBL finals. I hope everyone has been able to enjoy what continues to be a great competition.